Subject: Plate : 'Feeding sea-gulls at Ipswich.' 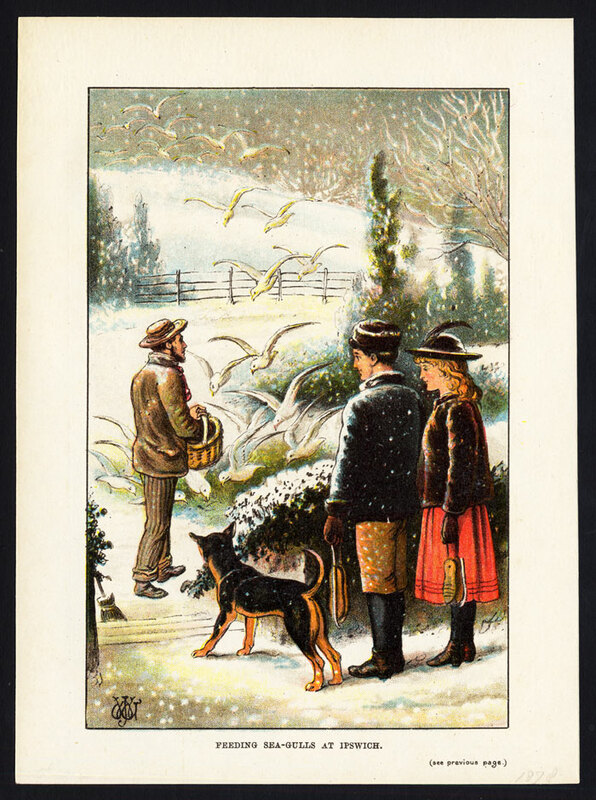 This plate shows a man feeding birds in the winter. A boy , girl and a dog are watching. Condition: Good. General age related toning and minimal staining and/or soiling. Medium: Chromolithographs on paper attached to black carrier sheet to prevend shine-through. Size (in cm): The overall size is ca. 17 x 23 cm. The image size is ca. 13 x 20 cm. Size (in inch): The overall size is ca. 6.7 x 9.1 inch. The image size is ca. 5.1 x 7.9 inch. Description: This antique print originates from an unknown source. Published ca. 1878.